One of the joys of living near the Thames is that you occasionally see some of the wonderful tall ships going up and down the river, local writer Alfred Gardner who has lived in the Docklands area all his life remembers the tall ships were a much more common sight and especially recalls the visit of the tall ship Pamir in 1948. Although Alfred was only seven at the time, the visit was considered quite a big event and luckily Pathe News made a couple of films about the visit. The Pamir had an unusual and chequered history, the ship was built by Blohm & Voss shipyards in Hamburg and launched in 1905. 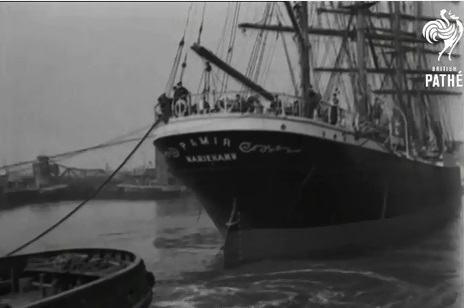 The Pamir was a four-masted barque and one of the famous Flying P-Liner sailing ships of the German shipping company F. Laeisz. She had an overall length of 114.5 m (375 ft), a beam of about 14 m (46 ft) and a draught of 7.25 m (23.5 ft). This ship was used by the Laeisz company for the South American nitrate trade, however during World War I she stayed in Santa Cruz de la Palma port in the Canary Islands from 1914 until 1920 when she returned to Hamburg. The homecoming was short-lived because she was handed over to Italy as part of the war reparation, the Italians did not have a skilled sailing ship crew to make us of her, so she was laid up in the Gulf of Naples. In 1924 the F. Laeisz Company bought her back for £7,000 and put her into service in the nitrate trade again. 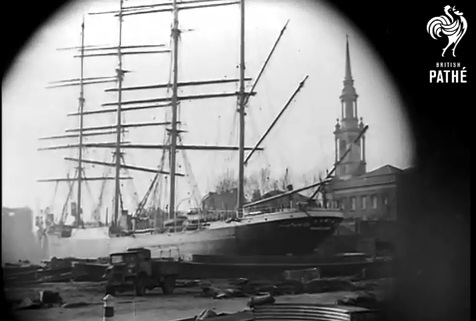 Laeisz then sold her in 1931 to the Finnish shipping company of Gustaf Erikson, which used her in the Australian wheat trade, she often took part in the Grain races for Australia to Europe. Remarkably, during World War II Pamir was seized as a prize of war by the New Zealand government in 1941 while in port at Wellington. She then undertook a number of voyages under the New Zealand flag, one of the last was the trip to London via Cape Horn in 1948. 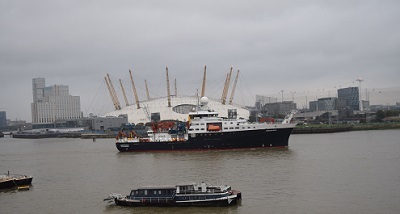 By this time, the Pamir was one of the largest and most famous sailing ships afloat, she docked in Shadwell Basin and attracted a lot of media interest especially with the visit to the ship by Princess Elizabeth and Prince Philip. A newspaper report gives the bare facts. LONDON, Princess Elizabeth and Prince Philip yesterday visited the sailing ship Pamir, which arrived recently from New Zealand. Princess Elizabeth told the Pamir officers that she and Prince Philip hope to visit New Zealand. The Royal couple toured the ship, watched the sails being rigged, and had tea with the commander of the Pamir, Captain Collier, his wife, and the ship’s officers. 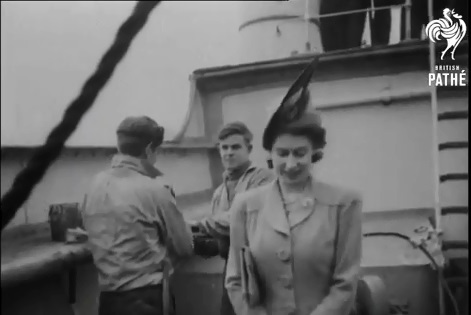 Pathe News made a short film of the visit that can be seen here, another film which is silent takes more of a look around the ship and showing the ship departing can be seen here. Although held in high regard by the New Zealanders who sailed in her, later in 1948 she was returned to the Erikson Line who proceeded to send the ship to Australia to load grain to take part in grain race to England. On her 128-day journey to Falmouth she was the last windjammer carrying a commercial load around Cape Horn in 1949. By the 1950s, the ship was considered economically unviable and was sold to Belgian shipbreakers in 1951. It looked like the end for the ship, but a German shipowner who had a great attachment to the ship bought her and had her refitted to accommodate merchant marine trainees who would help to crew the ship on voyages taking various cargoes to South America. In the post war Germany, the ship became a source of national pride and was recognised all over the world. 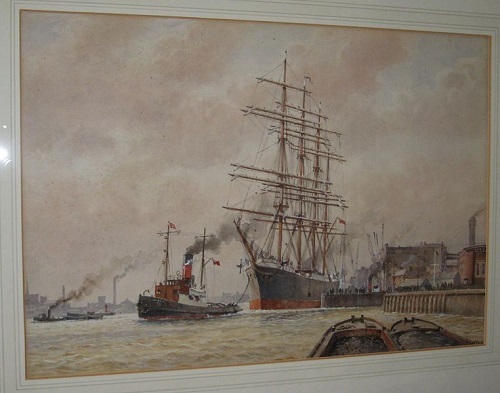 The visit inspired a watercolour by Richard Howard Penton (1882 -1960) who was a founder member of the Wapping Group of artists This watercolour dated about 1949 shows the Pamir leaving London. 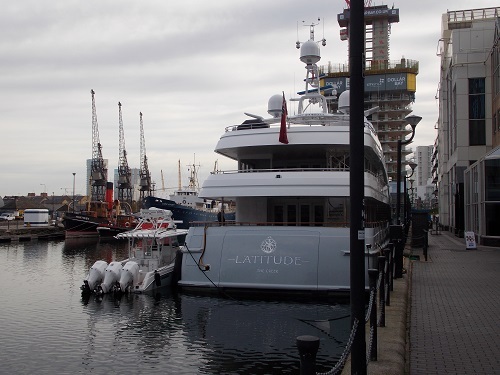 West India Dock has been the home of the Mischief super yacht whilst its Australian owner enjoys the Rugby World Cup, yesterday saw the arrival of another super yacht, the Latitude. 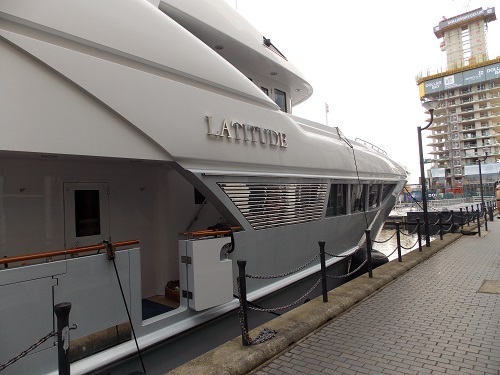 The 142.72ft /43.5m TM47 motor yacht ‘Latitude’ was built in 2010 by the Timmerman in Russia and was previously named Alexandra. 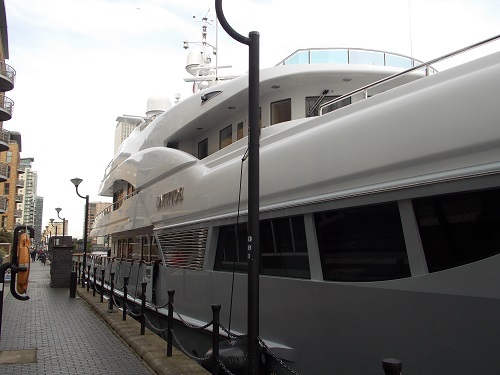 The ship has all the latest amenities including all the latest modern technologies for entertainment and plenty of toys for use in the water. 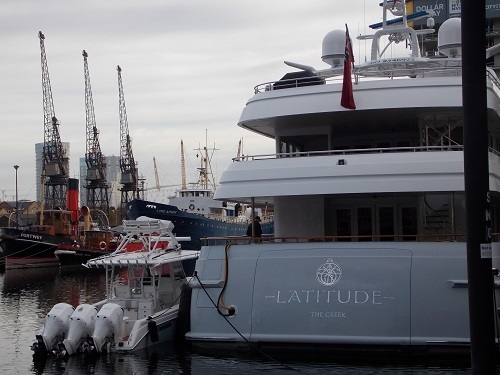 Like many super yachts there is an element of secrecy over who owns the ship which was sold in 2013, however it has been available for charter over the last few years. 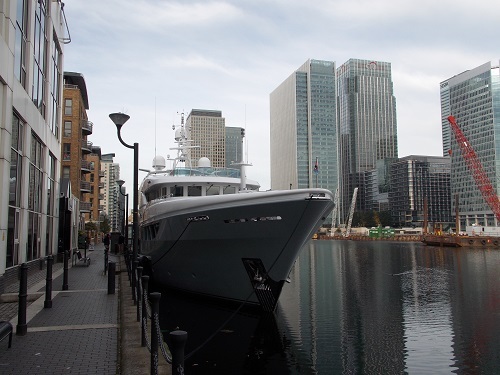 Super yachts are regular visitors to West India Dock but it’s virtually impossible to find out any information about how long they are here for and where they are going next. 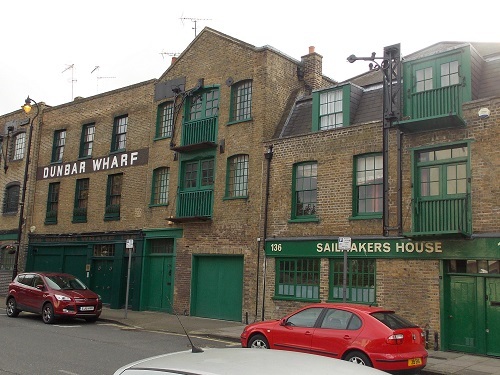 Although the late 17th and 18th terraced housing on Narrow Street is considered of great historical interest, Limekiln Dock and especially Dunbar Wharf convey some of the atmosphere of 19th century docklands industry. 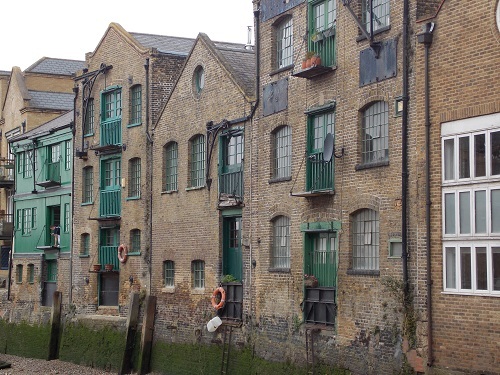 The original loading doors and cast iron windows of the small, early 19th century warehouses of Dunbar Wharf are a reminder of how much of the riverside would have looked in the 18th and 19th centuries. Although often overlooked today, Dunbar Wharf was home to one of the richest men in Britain who ran a large shipping fleet with connections all over the world. The story really begins with Duncan Dunbar senior who leaves Scotland and founded a brewery in Fore Street in Limehouse in the 1790s. His career as a brewer and wine merchant was obviously very successful because when he died in 1825 he left around £ 40,000 in his will. 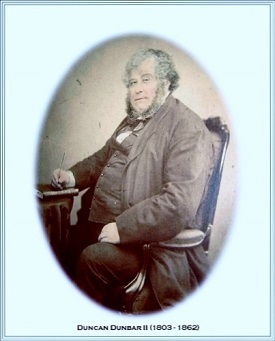 This wealth allowed his son Duncan Dunbar Jnr who was born in Dunbar Wharf to branch out into shipping. Young Duncan’s bought his first ship in 1827 and by 1842 his fleet stood at 11 ships, over next 20 years he ordered 42 new ships. remarkably there is little evidence that he had the ships built locally in Limehouse or nearby Blackwall. Many of his new ships were built-in the North east at the works of Philip and James Laing, a small number were built at Duncan Dunbar’s own building yard that had built at Moulmein in Burma. 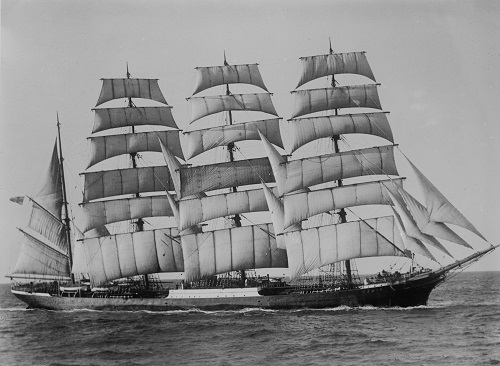 the Dunbar clipper ships were famous around the world and were often named after family members or Scottish place names from the family’s home county of Morayshire. Although there has been suggestions that he exported beer and spirits abroad, the ships carried a variety of cargo. Chartered by the government, Dunbar’s ships made 37 voyages carrying convicts mainly to Australia, a number of his ships were also used as a troopships in the Crimean War. Making full use of the cargo space, ships on the way back from Australia would go to India or China to pick up a cargo which often included spices, jute, teak, rice and ivory. These perilous voyages around the world occasionally ended in disaster, his ship the Dunbar was lost when the captain mistook the entrance to Sydney Harbour in a gale leading to a shipwreck and a large loss of life. These disasters did not deter Duncan Dunbar in his business activities which included founding the London Chartered Bank of Australia, being deputy-chairman of Lloyd’s Registry, chairman of the General Shipowner’s Society and deputy-chairman of the East and West India Dock Company. 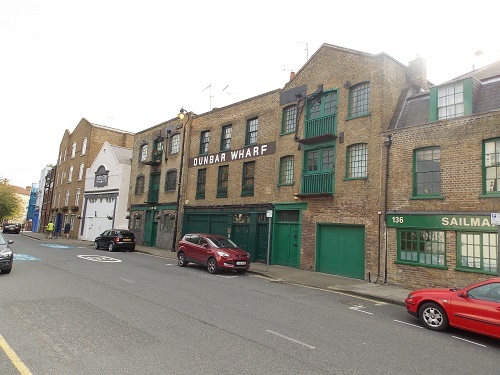 Duncan Dunbar jnr lived in initially at Dunbar Wharf until he moved in with his parents at Howrah House in Poplar, his mother’s died there in 1853 when Dunbar bought a house in Porchester Terrace, London. It was at Porchester Terrace that he built on a picture gallery and became a patron of the fine arts. In 1862, Dunbar suddenly died and left an estate worth between one and two millions (which would be worth around £65 million today). He never married and had no children, therefore the majority of his wealth went to other family members who showed no interest in carrying on the business. Within the next two years all of Duncan Dunbar’s ships were sold and that was the end of the Dunbar shipping line. Remarkably one of Duncan Dunbar’s ships still survives, he bought the Edwin Fox for long distance voyages. Regular contributor Coral Rutterford in New Zealand remembers in the 1970 seeing the remains of the Edwin Fox at Picton where it had been for a number of years, since then it has been made into an attraction called the Edwin Fox Maritime Museum in appropriately enough Dunbar Wharf in Picton. Mindfulness is often in the news, but what is it ? 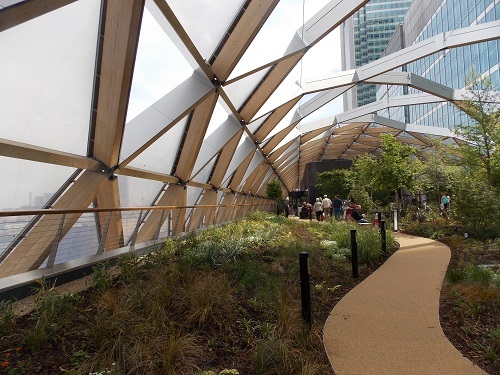 Well you can find out more by attending a free taster session in the Crossrail Place Roof Garden. 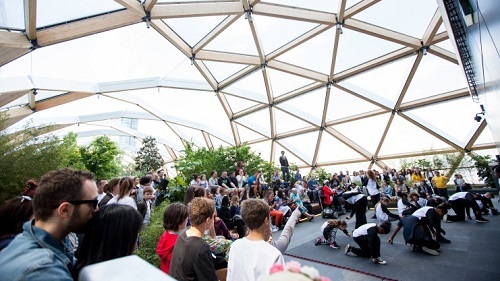 The sessions will be held in Canary Wharf Group’s community performance space within the garden and will be run by the BeingWell mindfulness social enterprise. The event is part the nationwide Social Saturday Awareness Campaign promoting the importance of using businesses that put people and planet first. There are at least 70,000 businesses in the UK that are classed as social enterprises who use part or all their profits for good causes. The BeingWell are one such social enterprise who are based in East London who use a proportion of their profits towards rolling out mindfulness to economically disadvantaged groups. The taster sessions will take place on Saturday 17th October 2015 between 3pm to 5pm. The session is free but you must book via the website. 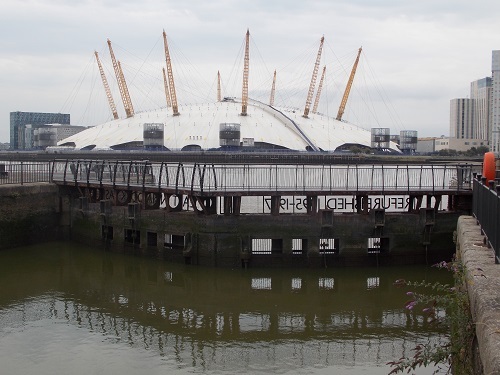 On my frequents walks to Trinity Buoy Wharf, the route comes across the East India Dock Basin, the last remaining section of the famous East India Docks and now home to a variety of birds in a nature reserve. 1940s – Export, Import and Basin still in use. 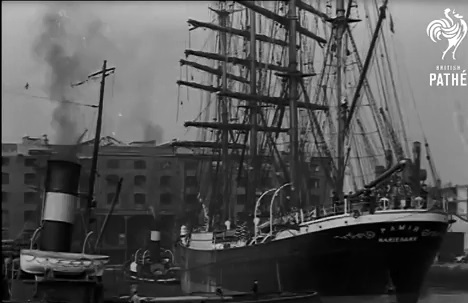 The East India Docks were built between 1803 and 1806 after the success of West India Docks which opened in 1802. The East India Company were well-known in the area and had been importing goods to Blackwall since 1600. 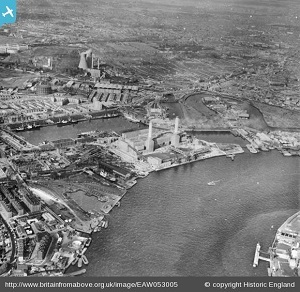 The docks were successful until the Second World War when bomb damage caused the Export Dock to close permanently and was subsequently sold in 1946 to became part of the site of Brunswick Wharf power station. 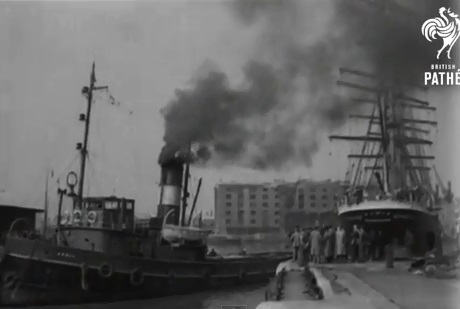 After the Second World War, the East India Docks handled short-sea and coastal traffic until 1967 when the decisions were made to close the docks. 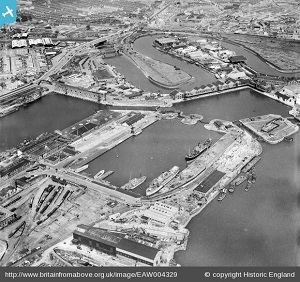 Between the late 1960s and the 1980s the Import Dock was gradually filled in, leaving only remnants of the Docks walls and East India Dock Basin. The quietness of the nature reserve may be a world away from the hustle and bustle of a working dock, however a quick walk around the area offers a few clues to the basin’s original use. 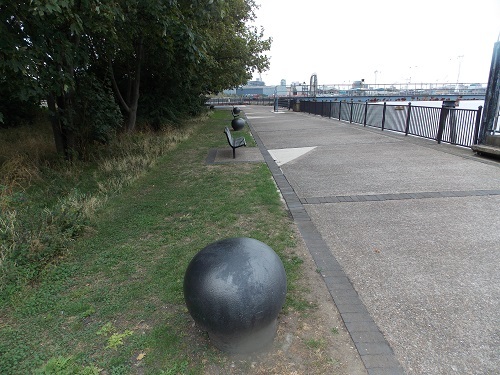 Ship bollards are dotted around the place like metal mushrooms and the lock gates are still in place. The East India Dock Basin connected the dock system to the river, via the East India Dock Entrance, which had two locks. 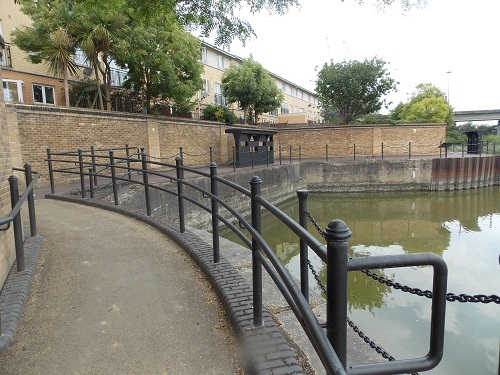 These lock gates were the sole entrance to the East India complex. They were enlarged in 1890 and refurbished in 1997. 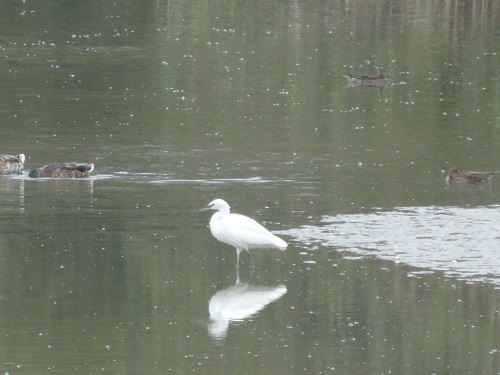 The nature reserve attracts a surprising number of different birds, including Kingfisher, Grey Heron, Common Teal, Black Redstart , Canada Goose, Cormorant,Great Spotted Woodpecker, Kestrel, Little Ringed Plover, Reed Warbler and Tufted Duck. 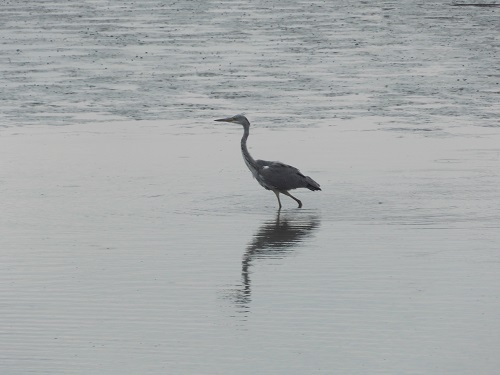 The tidal water in the basin is a mix of fresh and salt water and is full of fish that attract wading birds. 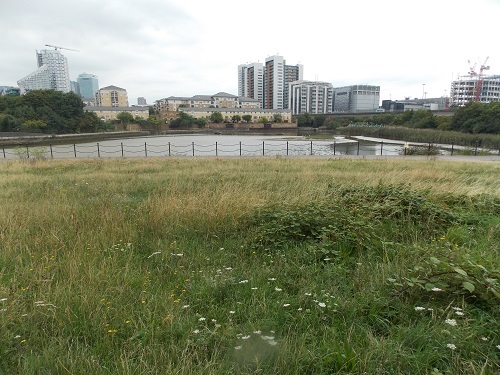 East India Dock Basin is owned and managed by the Lea Valley Regional Park Authority and is open daily between 8.30am and 5pm. 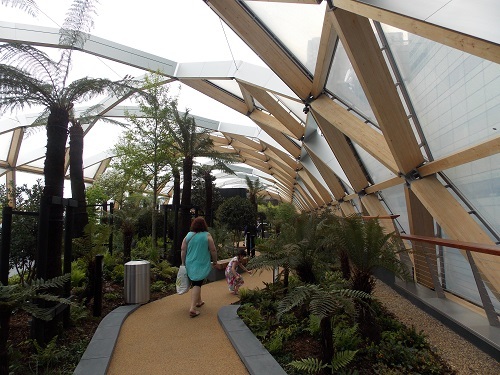 The dock is a 10 minute walk from East India DLR. 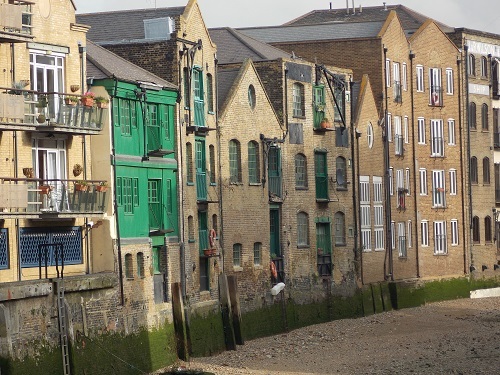 Regular readers will know that I often try to find books that feature the Isle of Dogs, it is often surprising just how many have featured the Island. Much rarer is writers who locate a series of books on the Island, one writer that does is best selling author Carol Rivers and I was delighted last week to receive a copy of her latest book, The Fight for Lizzie Flowers . Carol’s gritty and heartwarming East End family dramas are greatly influenced by her grandparents who lived in Gavrick Street and then Chapel House Street on the Island. The books are widely praised for their realism and have appeared regularly in many bestseller charts and have a loyal readership in the UK and increasingly in the United States. The Fight for Lizzie Flowers is second of the series of Lizzie Flowers dramas, the first in the series was Lizzie of Langley Street which took place in the period of the First World War. 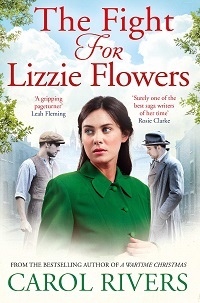 The Fight for Lizzie Flowers is set in the 1930’s and begins with Lizzie preparing to marry Danny Flowers. It was Danny who had asked Lizzie to leave for a better life in Australia but Lizzie was not willing to make the break from her family and ended up marrying Danny’s brother Frank instead. It was a decision she came to regret but had stayed with him until he met an untimely end when he was drowned and fished out of the Thames at Limehouse. Since Frank’s death, Lizzie had made a great success of running the Flowers greengrocer’s and Danny had come back to ask her to marry him. For all her hardships of the past, it now seemed her future was bright and full of hope. However an unwelcome guest arrives and Lizzie’s life is turned upside down. What sets Carol’s book apart from many others of the type is that she creates believable characters who inhabit an Island that is still reliant on the docks and where family is still of great importance. Whilst the extended families were a great source of support, sometimes loyalties were divided that leads to conflict. This is another characteristic of Carol’s book, she often displays some of negative aspects of London life when characters go off the rails. But for all the conflict, Carol pays tribute to the strong characters, often women who kept families together through adversity. Lizzie Flowers is one such character who is full of true East End grit who will not be defeated by life’s injustices and hardships. 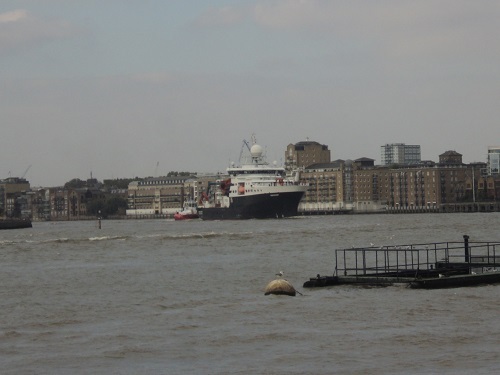 Many thanks to regular contributor Eric Pemberton who managed to take some photographs of the RRS Discovery has it made it way past the O2. 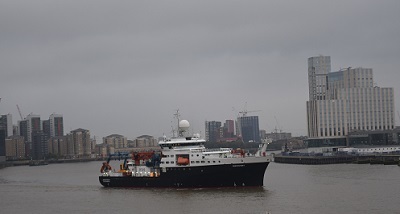 The rare visit of the research vessel is to celebrate 50 years of the Natural Environment Research Council. 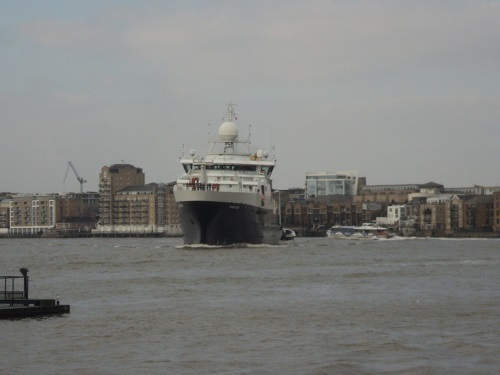 RRS Discovery will be moored alongside the HMS Belfast in London from Wednesday morning until Sunday 11 October when she will return to Southampton to mobilise for her next research cruise in the Bahamas as part of the RAPID climate change project. Science and technology from all NERC Centres will be showcased on board, and hundreds of members of the public, industry professionals and government stakeholders will visit the ship. Members of the public have won tours of the ship through competitions held by the Natural History Museum and radio stations. On Friday afternoon and Saturday in Potter’s Fields on the South Bank, staff from NOC, Centre for Ecology and Hydrology, British Geological Survey, National Centre for Earth Observation and National Centre for Atmospheric Science will be undertaking ‘science busking’ – talking to passers-by about the ship and the research undertaken at their centre. 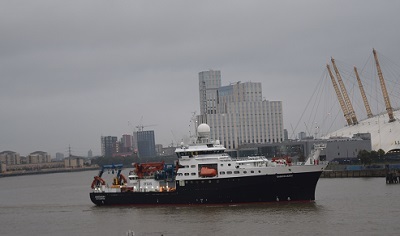 The Royal Research Ship Discovery has completed her first year of research. Over a series of nine research expeditions, scientists studied the seasonal events taking place in UK shelf waters throughout the year. 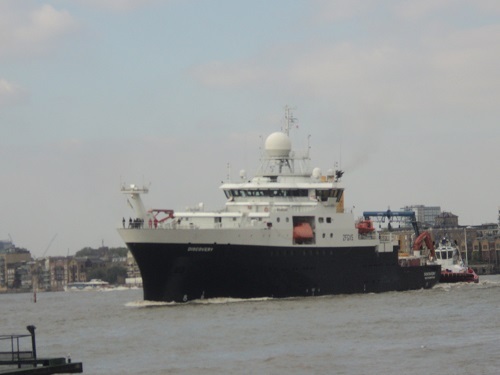 The vessel, procured by the Natural Environment Research Council for UK science is the latest in marine technology. Science teams used robot subs, landers and underwater gliders and other tools on board the ship to measure the processing and transport of material between relatively shallow shelf seas. 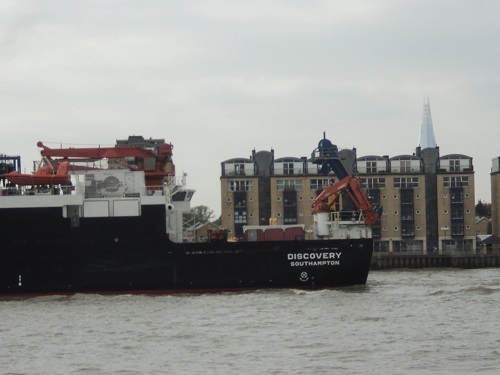 The ship was launched in April 2012 and named in October the following year, RRS Discovery is the newest addition to the UK’s fleet of research vessels. 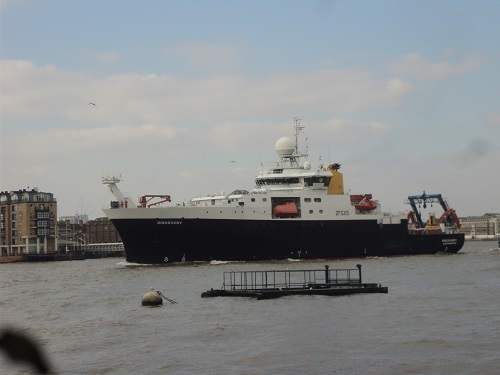 She cost £75m and is designed to support world-leading marine research everywhere from tropical seas to polar oceans. The ship actually left Tower Bridge on the 12th of October and I managed to catch her making her way around Limehouse Reach and took a few photographs.